Aesthetic Blasphemy: God is an Inconsistent Function! God is an Inconsistent Function! God! The topic of endless debates. A mystery that has led to many conspiracy theories, whose followers call them, ‘Religion’. Some say He’s ‘nirankaar’ (formless) while others believe in His definite form. Sometimes, He comes as a child to take away your sorrows, and sometimes, in a form incomprehensible, to obliterate evil. Some say He’s omnipresent, and can be seen wherever we wish to and in any form, while some believe He never descended the stairs of heaven. Communication was through messengers or sometimes He sent his Son, when matters were grave. Well nowadays, He cannot possibly risk sending Emails for they’ll be treated as spam. And if He sends SMS then maybe, vandals keep giving him missed phone calls. Am not sure of the network connectivity in heaven either! (I am constantly updated with activities going on in hell, so no network problem there). There’s another group with the most different notion, “God is an inconsistent function”. They propound the theory that God is a creation of human brain, quite the other way round to most of religious beliefs. I have had an experience of a few interpretations and I remember two of those. Well read carefully, because the people who narrated them are highly religious and also highly scientific. They believe in God but tried to interpret him within scientific bounds. Hanuman: Ancient people were great scientists. Science made great progress in olden times. The people we call Saints (‘Munis’) today were experimenters then. ‘Havan’ was a chemistry experiment to study the properties of various organic materials when subjected to pyrolysis. The results and observations of these experiments were encoded as scriptures in form of beautiful and narrative stories, so that the immense power of those findings did not fall into wrong hands. ‘Asurs’ were similar scientists bent towards destruction and ‘Surs’ or ’Devas’ were the most enlightened scientists who made their facilities up in the air. Weapons were far more sophisticated than America can build today (think of Brahmastra). But the knowledge was lost as the brain size shrank and this is where we all are today, still trying to catch up with ancient times. 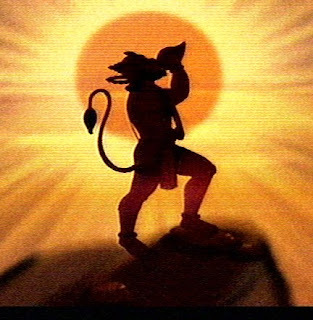 ‘Hanuman’ is a Deva, who descended down to earth to protect the Munis from Asurs. And how he came to be symbolized as a Monkey form? He was the pioneer in flying. He indigenously devised a jetpack. Now as every propulsion machine has an exhaust line, his exhaust became his tail. While flying at high speeds in air, anything small can damage you, even dust can wreck your face. So he had to wear a mask. And silly we, interpreted him as a flying monkey. 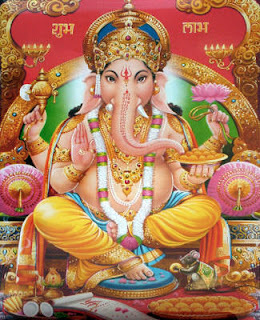 Ganesha: The God who is worshipped before any other God in any Hindu religion’s function. Well, he is really huge, has a head of Elephant, has a protruding tummy and still, rides a rat. Strange? I find every religion strange for some of their ways; this one’s far more interesting than absurd. He’s the lord of prosperity and ‘Riddhi’ and ‘Siddhi’ accompany him. Legend says that He was beheaded by his own father, Lord Shiva, when He stopped Shiva from visiting mother Parvati in her ‘snaanagaar’ (bath), as per her request. Later, due to Parvati’s insistence and anger, they had to put him back in one piece. So they used an elephant’s head. Now, theorists found it fundamentally wrong. How can a massive head be put on a small human body? There were concerns of stability and about centre of gravity shifting, making the whole body unstable. So, they augmented his body with a big fat protrusion around the belly. And this is how he came to be worshipped in his present form. Regarding the rat being his carrier, my narrators did not mention anything, neither did I ask. *I know my Lord understands me and what I mean. So I won’t apologize to anyone if I hurt them through this Post. Jai Hanuman! That was a nice post.. thanks! Thanks everyone for the appreciation. He does love me, otherwise I'd have been an atheist. I liked it, I would like to hear more of your narrators. I would surely tell you all as soon as I hear more interpretations.